Yesterday I mentioned the importance of having your work available online. Today I'm going to expand on that and give two reasons why I think this is important. MAKE LIFE EASY FOR CURATORS - THEY LIKE THAT! Things have changed in the art world: I believe that curators increasingly expect to be able to find information about artists online. Of course, it could just be me, I am very immersed in the net, having been online for about 12 years at this point. However, I personally know several other curators who take a similar approach to me. That's not to say that curators primarily look for artists online yet (although I know at least one who does) but I believe curators are using the web to expand their knowledge of an artist who has come to their attention. When I'm curating an exhibition, I still advertise for artists through print media and expect artists to send me postal applications. However, if I get a postal application and I'm interested in the work, my next step is always to Google the artist's name to see if I can find more images of their work. I won't discriminate against an artist if they're not online but it does make it harder for me to accurately judge their work. In an exhibition application it's usual for the curator to set limits on the number of images that an artist should send. Briefs typically say something like "10 images max" and it can often be less than ten. This is to prevent curators being absolutely inundated in stuff: if you get 50-70 applications for an exhibition you simply don't want to look at every single piece of work each individual artist has ever done! However, it's quite difficult to judge an artist from 10 imges or less, a CV and an artists' statement. So I Google. Googling artists puts an artist in context for me and expands on the information that they've already sent me, allowing me to make a fairer and more informed judgement about their work. It also allows me to make my own judgement on which piece to include. Sometimes an artist will send me images of what they think is their best piece but if I can see more of their work online, I might find a piece that is actually much more appropriate for the show I'm trying to curate. That can make the difference between being included in a show and being turned down. So can you see how having a visible online presence can widen the odds for you? By being visible online (under your professional name, of course), you allow other people to do your promotion for you. This works largely through the medium of blogging, although occasionally artists are picked up by the larger mainstream media because a story about them has appeared online. 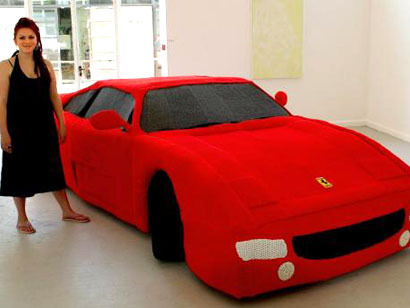 British artist Lauren Porter got global media attention when she made a lifesize knitted Ferrari for her degree show at Bath Spa University. Now I don't know whether she first got attention in the mainstream media and it then spread online or if it was the other way round but either way, the fact that photos of her work were available online meant that it was very easy for bloggers and online communities to distribute the story. It went through the enormous online knitting community like wildfire but a quick look on Google shows that it was also linked in geek blogs, car enthusiast blogs (including the Ferrari Owners Club), craft blogs, art blogs, popular news blogs like Digg and even YouTube: the coverage was truly vast. Visitors to her Bath Spa University degree show would probably have been in the hundreds, maybe as high as a thousand or so but I'm absolutely certain that millions of people saw her work in newspapers, magazines and online. What a way to start your art career! Of course, Lauren's piece was an incredibly appealing story and wouldn't have been a hard sell in any media but I believe that any artist can find themselves being promoted by other people through the medium of blogs if they're doing interesting work. Even if you don't break out into the mainstream media, there are a large network of artist bloggers, some more influential than others, who will happily link to your art if you make it easy for them to do so. Of course, being easily found online won't mean that you never have to do any promotion but it does mean that once you've started the ball rolling, other people might pick it up and run with it for you. Neither of these things will help you if your work isn't any good: making good work must always be every artist's first priority. But if you've reached the stage where your work deserves a wider audience then building an online presence can help to give you a leg-up in the art world and may bring opportunities your way. Building a visible online presence should never be all the promotion that you do but it should definitely be some of what you do. If you're not on Google then you're basically invisible in the modern world and artists who want to succeed just can't afford that. Over the next few weeks, I plan to follow up this article with more detailed ones about how to create a visible online presence. Posted in Blog, Succeed online. Tags: advice, Series: Artists Online on August 10, 2007 by Kirsty. Great post, Kirsty. The Web is such a new promotional device. It's nice to see how curators like you are using it to get to know artists better. Thank you for such a positive article about getting artwork online! There seems to be galleries on both sides of the 'artists online' issue - those who want it for exactly the reasons you state (and artists who get online for just that reason) and those who fear it means artists representing themselves will undermine their galleries. Needless to say I and most artists I know wouldn't do the latter; we want and need our gallery relationships. I'm going to share this on my blog and spread the word. This IS a good blog post! However, commenter Mark mentions the point to my question. Once you get online, how do you promote your "presence" to get optimal visability? Thanks for writing about artists online! I also had a glossy magazine contact me and do a double page spread article purely based on seeing my work on the website. Really enjoyed this post! It's so welcome to read not only about other artistic successes but how an internet presence can open new doors. Most of my professional contacts came through my web site. My Google ranking moved from Invisible to bottom of the first page when I posted my vita ~ only because the search engines look for key words and my name and location were repeated so often. I plan on adding an artist statement very soon! It's absolutely true. A curator from the "Art in Embassies Program" found my website online and invited me to show in an American Embassy in Africa. It takes time and effort to get great visibility online, but it's totally possible. I am quite glad to know curators are using the internet to find us. Are there keywords curators are searching? Am I the one? I do all my curation via the internet I would say- I can't really think of anything i've put on that hasn't been from the internet first. Maybe the show i'm putting on in November is the exception as I saw Claire Platt's work in real life first, but I guess I met her via the internet in the first place. Was going to write more, but have to go to mum's for a BBQ now! Now I need to put more thought into the move away from Milla and towards Camilla...what do you think? It's easier to have a strong web presence of course if you're something of an internet whore. My job is painting but my hobby is working on my website, my blog, etc. Endless fun and it complements my career -- though when out of control it also interferes with it! :) I'm always looking for new outlets for my work, though, and it's actually starting to come to me when before I always had to chase it down myself. Sigh, what I wouldn't give for threaded comments. It's one of the things I like most on Livejournal and I can't understand why the rest of the blogging world doesn't have it. Anyway folks, I've read all your points and I'll be emailing those of you who've left your addresses. I'll try to cover the issues you've brought up in the rest of of my 'artists online' series. Hi Kirsty, Very interesting blog and site! I love what you had to say because I'm constantly writing about my artist client, Gali Rotstein, in my blog. It's validating to learn that this is the new way to approach curators. Thanks for the information. Can't wait to read the next post! Hi Joy, I'm glad the article was helpful to you and Gali. Now that my brother's wedding is out of the way, I'll be getting back to the series sometime this week. Hello! Great article. I worked as a curator for 5 years, and artists with websites are "hands down" more attractive. Galleries and museums not only need to get used to working with and using the internet and social networking tools to find artists and even do business....but, they need to see the reality of how things are changing fast in the 21st century. What I see in the 21st century is a major shift in how and where we do business in general. Companies, organizations, and, yes, even galleries, have to work twice as hard to prove their importance in this tech-driven and innovation-savvy society. Galleries and museums will have to do a much bigger job, because the preferred entertainment are most likely online social networking/gaming, watching sporting events, and clubs/concerts..not so much galleries..and their audience will get smaller and smaller until the galleries and museums reinvent themselves to adapt with this new 21st century culture. It is a scary thing for gallery and museum directors and owners, and many don't want to admit it, but it is very true. The major galleries/museums will still have a following because they are seen as "major tourist attractions (i.e, The National Gallery of Art in Wash. D.C.). My advice is to not only use the internet to help you do artist research, but to use it to reinvent your role in this new and very internet and social network driven world. Hi Christi, thanks for visiting my blog and commenting. I'm glad you enjoyed the article. Would you mind if I quote your reply? I like to point my readers at some of my more interesting comments and yours certainly qualifies. Being a new artist myself, i totally agree with how beneficial the internet is for artists. I myself am a member of the large online art community DeviantArt, i recommend it for artist advertising and finding great artists. I'm adding to my gallery as i go, just returned to the site actually. Hi Makya, welcome to the blog. I've not used DeviantArt myself but I know of several artists who do, including one who's really built up a huge following there. Hi, great article, I totally agree - if you want to be found these days having a website is a must. Without a strong online presence you are starting on the wrong foot! Hi DesignLondon, welcome to the blog. I think you're right that a website is a complete necessity - and even more so now than when I originally wrote this post. You're very welcome, Samantha, I'm so glad you found it helpful.